Black piano stools for sale. Black is just one of a selection of wood colours available for your new piano stool. Just Piano Stools have the widest choice of quality piano stools. UK postage is included in the price. These piano stools are made to order. Delivery is normally between two to three weeks for a Woodhouse stool. Please allow up to six weeks for a Tozer or Discacciati stool. This black piano stool is an example of one of the colours available for Woodhouse piano stools and is available in satin or gloss finish. See the full range of wood colours available for Woodhouse piano stools. Black piano stools are also available from Tozer, Stagg and Discacciati. These black piano stools are manufactured by Woodhouse, Tozer, Stagg and Discacciati and are made to order. This normally takes approximately two to three weeks for a Woodhouse or Stagg piano stool. For a Tozer and Discacciati stool please allow up to six weeks. Below you can select the type of piano stool you require. All of following piano stools are available in black. 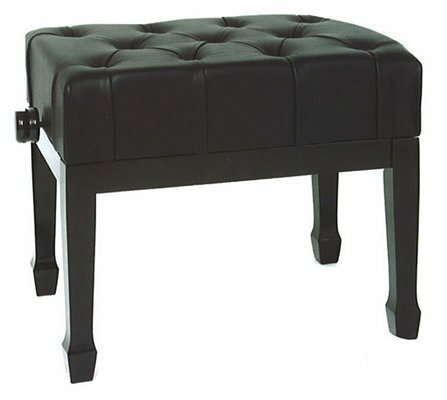 Black is just one of the options available for our adjustable solo piano stools. They offer greater flexability and have a wide selection of options. See our range of fixed height duet piano stools, all hand finished in the colour and finish of your choice including black. Organ height stools with music storage and straight legs. Available in a selection of wood colours including black. View the adjustable round piano stools available in a range of fabric and wood colours. Available in satin or gloss black.